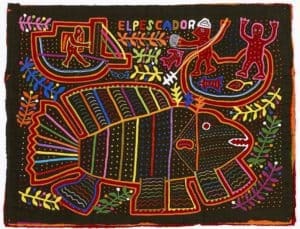 Molas are colorful reverse-appliqué panels made by the Guna, an indigenous people who live in Panama. Since the 1600s, the Guna have maintained trade and diplomatic relations with Western countries. Guna women began using foreign trade cloth to create bold mola panels for their blouses around the turn of the twentieth century. Throughout their history, molas have embraced both tradition and cultural change. Today they are an important symbol of Guna pride and political independence, as well as a key source of income for many Guna families. Molas: Social Fabric presents a selection of works that reflect the vitality of Guna culture, with imagery ranging from Central American wildlife to Elvis Presley. Molas: Social Fabric is supported through the generosity of Mrs. Eleanor P. Laubner.